Is fingerprint auth right for your app? Take a look at some of the advantages of utilizing fingerprint authorization for mobile devices. Modern security is a battle between high security and low friction. Developers want users to use unique, complicated passwords for their apps to increase security. Users, faced with the challenge of remembering a number of different passwords, want to use the simplest password or passcode possible. This makes it easier to remember, and makes access to the app or site quicker, but is fatal for online security. Performance: Modern capacitive touch fingerprint sensors (such as the Touch ID sensor on the latest Apple iPhones and sensors on recent Android devices) recognize the fingerprint and unlock in less than a second, quicker than inputting an extensive password. Security: Fingerprints are unique (even among identical twins), impossible to guess, and difficult to fake without significant effort. Modern fingerprint authentication uses the fingerprint to create an encrypted key, which is sent for server authentication. Permanence: Complex passwords are hard to remember, leading to the majority of people reusing passwords on multiple sites. As a physical feature, fingerprints are unforgettable. First mobile device with a fingerprint sensor: The HP iPAQ Pocket PC h5500, initially released in 2003, running Windows Mobile. First cell phones with a fingerprint sensor: The Toshiba G500 and G900, launched in early 2007. These also ran on Windows Mobile 5.0 and 6.0, respectively. First touchscreen smartphone with a fingerprint sensor: Motorola Atrix 4G, released in 2011, running Android 2.3. In 2013, Apple released the iPhone 5S, which included their Touch ID fingerprint recognition system. Touch ID differed from previous systems because it could be used to both unlock the phone and authenticate App Store and iTunes purchases. Now most flagship devices from manufacturers include fingerprint sensors, and Android 6.0 (“Marshmallow”) includes native support for fingerprint recognition. 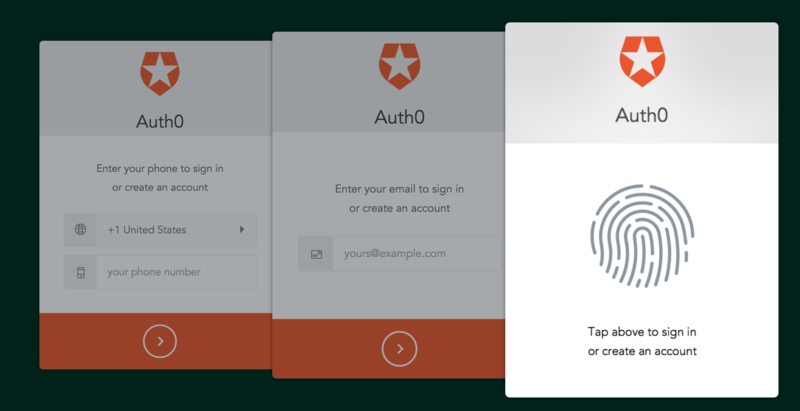 You can authenticate users with Touch ID with Auth0. The fingerprint itself is never sent. Instead, when a user signs up and elects to use fingerprint authentication, the library will generate a key pair on the device, a public key and a private key. The user will be created in Auth0, the public key will be registered for the user, and the private key is stored in the keystore of the device. Passwordless authentication allows users to log in without a password. Usually, this is achieved by sending a magic link through SMS or email. The user can click on the link on their device and will be automatically logged into the app. Instead of sending a magic link via SMS or email, fingerprint authentication through Touch ID can also be used to authenticate the user. MFA allows for increased security by requiring users to present more than one piece of identifying information. Usually, this is a mobile device itself—the user inputs their password into an app as the first authentication, then uses an additional layer of security such as a code generated by Google Authenticator tied to their smartphone as the second piece of authentication. However, you can also use fingerprint recognition as the second level of authentication. Users input their password, but then also have to present their fingerprint to verify their identity. Step-up authentication is also a multiple step authentication process, but one where an additional level of authentication is required to access different levels of resources. A user can sign into the regular app with their username and password, but if they try to access a restricted part of the app or site, they are required to present further authentication information, such as a fingerprint. Fingerprint authentication is not currently part of the built-in capabilities of MFA and Step-up. However, Auth0’s flexible rules execution pipeline makes it easy to use these passwordless authentication methods as part of an MFA flow. Simply call the passwordless connection using a redirect rule, and treat it as a custom MFA provider.